This module aims to demonstrate how different conceptual frameworks can help us better understand the connections between human well-being and nature and what is required to maintain well-functioning ecosystems in practice. This training resource material has been developed by the UNEP TEEB office in collaboration with its various partners. The contents build on the 2012 TEEB reports and draw from the wealth of training materials developed under previous TEEB Phases, as well as under other relevant projects and initiatives e.g. GIZ training guide on how to integrate ecosystems services into development planning, SCDB online modular training course focusing on valuation and WBCSDs Business and Ecosystem Training. 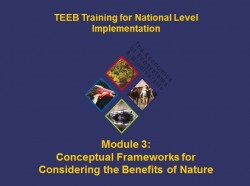 This training resource material can be used freely by any person or organization interested in delivering a TEEB training course and we encourage the wide use and adaptation of this material to fit country or region specific contexts. In order to receive the modules and session documents in workable formats, please send a request email to teeb@unep.org. Introduction Introduction Presents the module, sessions and objectives. Session 1 Conceptual Frameworks This session discusses in detail the different conceptual frameworks that exist and are available for assessing and valuing ecosystem services and biodiversity and considers their various purposes and objectives. If asked, explain that a conceptual is a theoretical framework used in research to outline possible courses of action or to present a preferred approach to an idea or thought. Session 2 The Challenges of Ecosystem Valuation This session highlights the various challenges and limitations involved in ecosystem valuation. It also discusses the links between ecosystem valuation and poverty alleviation as well as the links with the Millennium Development Goals. Session 3 From Concepts to Action This session demonstrates how these concepts are currently being translated into action at the international level and considers the various different activities, including TEEB itself, that are currently being executed. Bibliography Bibliography Lists the key resources for the module.